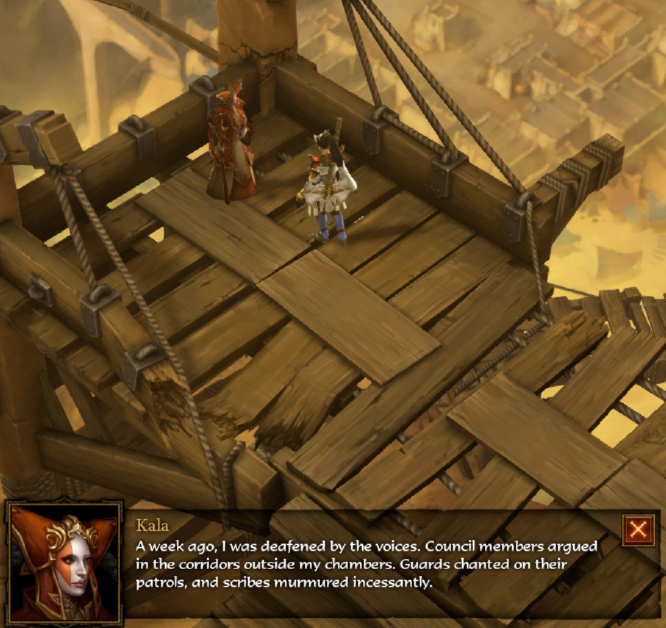 Shortly before the player meets Kala, Emperor Hakkan II (a child who became Emperor of Caldeum) became paranoid. He ordered all of his staff to leave the city and threatened to throw them off the walls if they refused to obey. Kala is a noblewoman who was among those cast out of Caldeum. She ended up in The Hidden Camp, wearing the fancy clothing favored by the nobles, and wearing makeup in what appears to be the current style in the palace of Caldeum. Kala: I have never been outside the city my entire life. I have never even been outside the palace. Kala: When they threw us out here, I thought I would die. I was terrified. Kala: But now… look at this view. I have never understood how large the world actually was. It is beautiful. 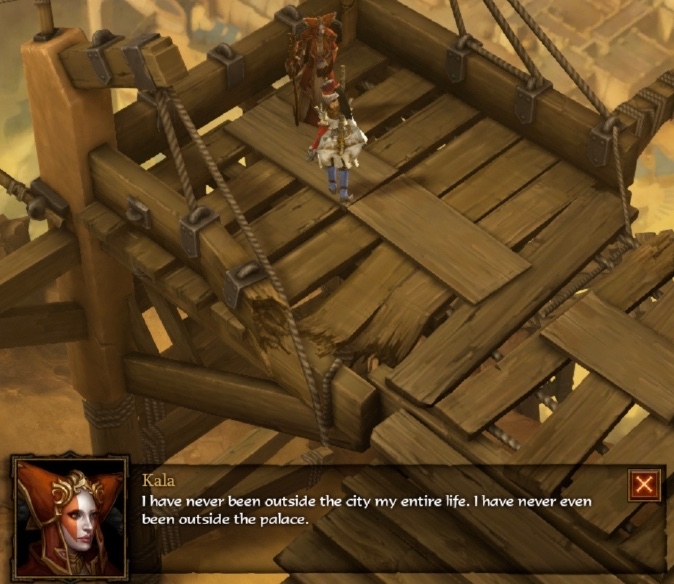 Kala said she has never been outside of the palace. From this, we know that her parents were nobles who lived in the palace. Kala was likely born there. Her parents were probably born in the palace, too. It isn’t unheard of for the wealthiest people to stick together and segregate themselves away from people who aren’t as rich and privileged as they are. 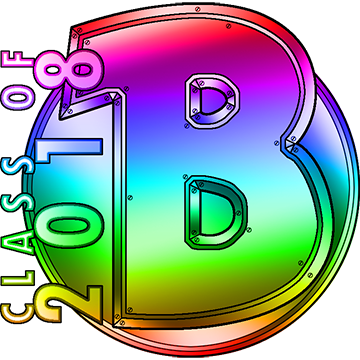 The result is that Kala (and the other nobles who were kicked out of not only the palace but also the city of Caldeum) are now experiencing severe culture shock. Kala is in a camp, wearing clothing that does not appear to provide much protection from the elements. She might have some money on her, but it won’t last forever. She is homeless and the people around her are unfamiliar and from a different social class. It is no wonder that Kala was terrified and thought that she would die. 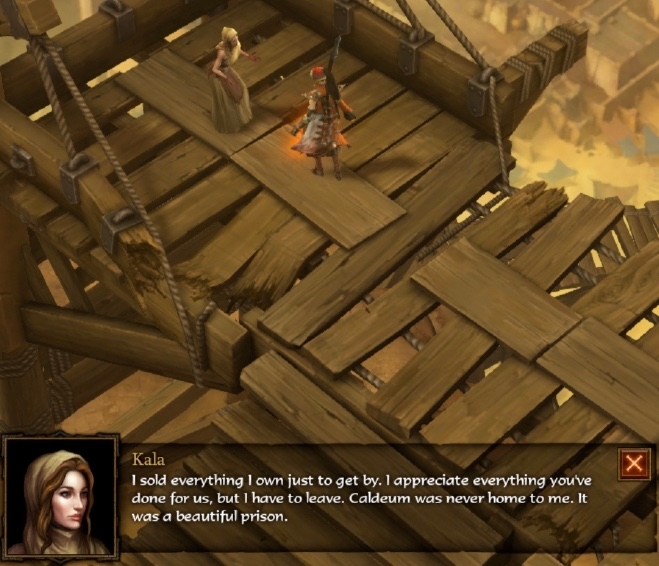 Some time has passed between Kala’s abrupt eviction and when the player character meets her. In the meantime, Kala is starting to take a look around. She learned that the world is much bigger than she realized. Despite the hardship Kala is facing, she still is able to see that Caldeum, viewed from above, is beautiful. 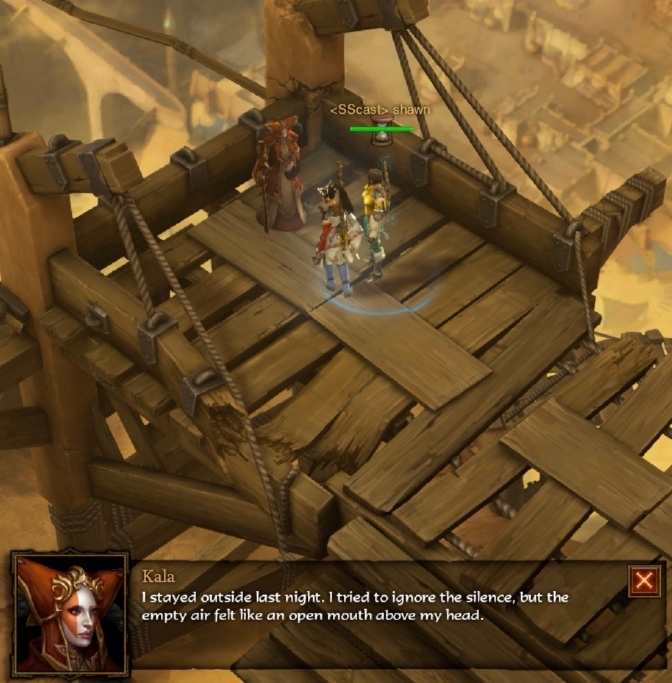 Later, after the player has finished some quests, Kala has more to say. Kala: I stayed outside last night. I tried to ignore the silence, but the empty air felt like an open mouth above my head. It sounds like Kala slept outside, right where she is standing. The Hidden Camp doesn’t have an inn, and she could not have gone back to Caldeum. I don’t think she had any choice other than to sleep outside. Kala says she “tried to ignore the silence”. It is not unusual for people to be quiet when it is time to sleep. 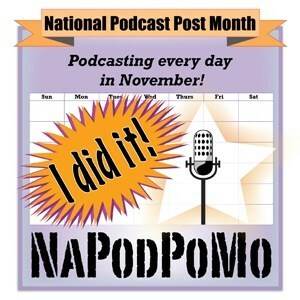 It appears that the palace, filled with nobles, was a noisy place! Kala spent her life surrounded by people, some of whom did not care how loud they were when people were trying to sleep. Now, she’s outside for the first time. Kala notices the silence at night, and finds it unnerving. She feels like the “empty air” is “an open mouth” above her head. Kala is still experiencing culture shock. Kala: Eventually, I realized I had to sleep. If someone was going to kill me, I was already dead. I hadn’t slept that well in years. Kala is just starting to learn how to live outside of the palace. She’s slowly adapting to her new life, and is becoming much less afraid. She learned that sleeping outside won’t cause her to die, and that silence helps people to sleep well. She’s still woefully unequipped to live outside the palace. Kala must figure out what to do now that she has been pushed into this unexpected new life. 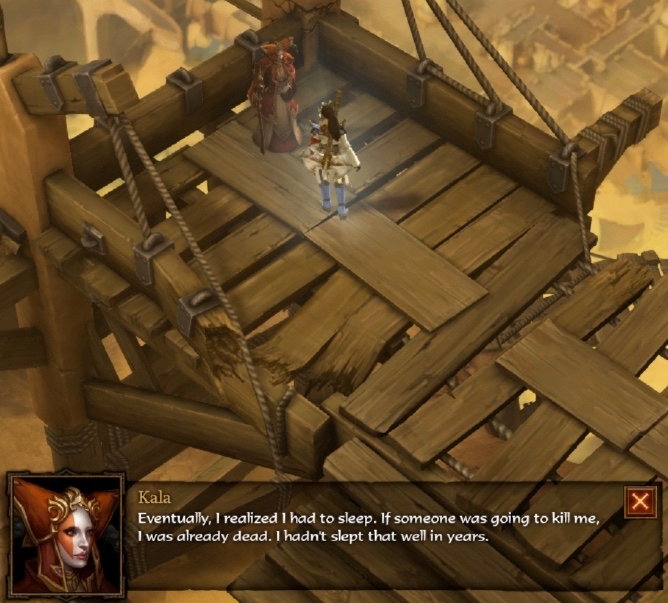 A week passes between when the player character last talked to Kala, and when they speak again. Kala: A week ago, I was deafened by the voices. Council members argued in the corridors outside my chambers. Guards chanted on their patrols, and scribes murmured incessantly. 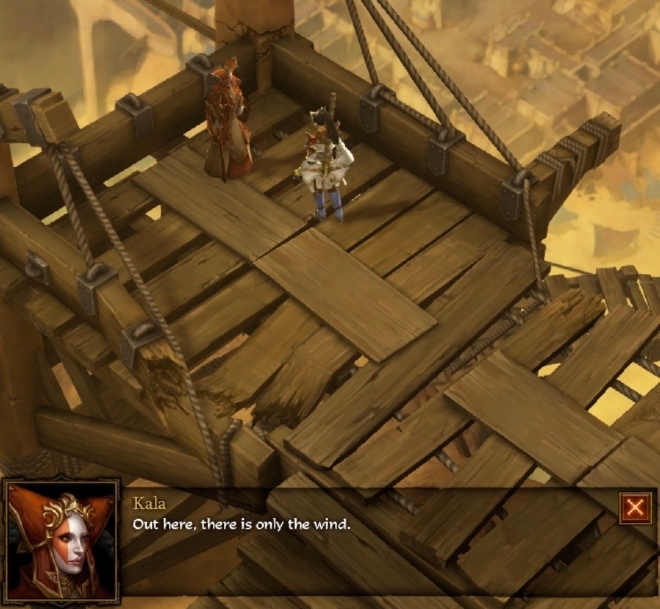 Kala: Out here, there is only the wind. It would be easy for a noble who has been kicked out of what must have been a life of ease and luxury to be very angry and resentful about losing that standard of living. Things will be harder, and sparser, outside the palace. Kala has somehow reached the point where she is not only adjusting to her new life but also finding it to be beneficial. She cannot go back to the palace, but even if that were an option open to her, it appears she might not choose to return. All that silence has given Kala time to think about her life. She has new things to say when the player returns. 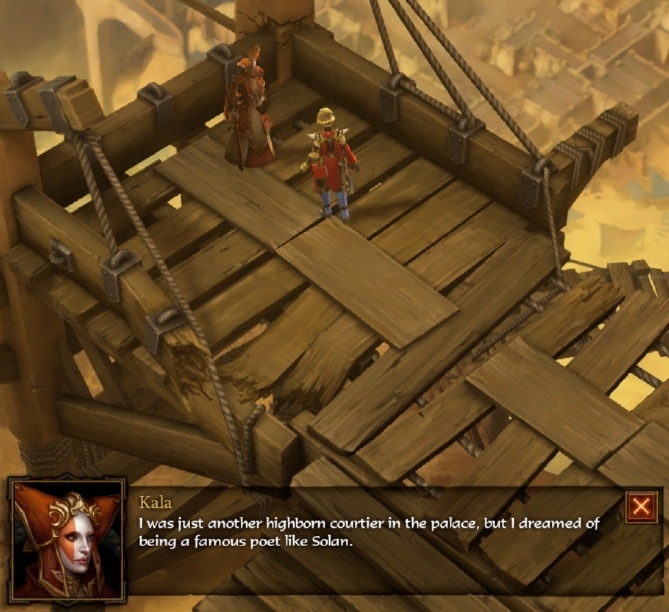 Kala: I was just another highborn courtier in the palace, but I dreamed of being a famous poet like Solan. A courtier is defined as “one in attendance at a royal court”. It is also defined as “one who practices flattery”. Kala was a courtier in the court of Emperor Hakkan II. She spent a lot of time mingling with the other highborn courtiers, who were there to flatter the Emperor. Courtiers are expected to to spend time in the royal residences and follow a strict etiquette (which covered body language, manners of speech, and acceptable attire). Sometimes, the ruler would award courtiers who had earned his favor with some money or gifts. Every courtier is there to try and improve their own finances and importance. I suspect being a courtier was a similar experience to being in high school and trying to be part of – or remain part of – “the cool kids”. Courtiers may appear to be friendly with one another – but they are not friends. It may have been perfectly acceptable for Kala to read the work of a famous poet. There was no way she could become a poet herself, though, while fulfilling the social obligations of a courtier. Kala: Have you read his work? It makes your heart sing! My ability is nowhere near his, but I suppose you will see that for yourself. Kala drops a poem that she wrote. It appears as a journal for the player to pick up and listen to. 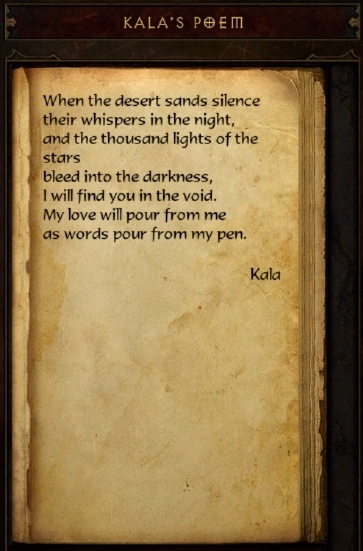 Kala’s Poem says: When the desert sands silence/ their whispers in the night/ and the thousand lights of stars/ bleed into the darkness, / I will find you in the void./ My love will pour from me/ as words pour from my pen. It is unknown who Kala wrote this poem about. Maybe she had a romantic relationship with another courtier. Or, she may have decided to write a love poem because that was the type of poetry Solan wrote. The next time the player sees Kala, it is clear that she has changed. Gone are the fancy clothes and makeup. Kala is now wearing a simple, plain, dress that is similar to the ones worn by the common women in Caldeum (and New Tristram). The dress has a apron, and Kala is wearing a scarf over her head. 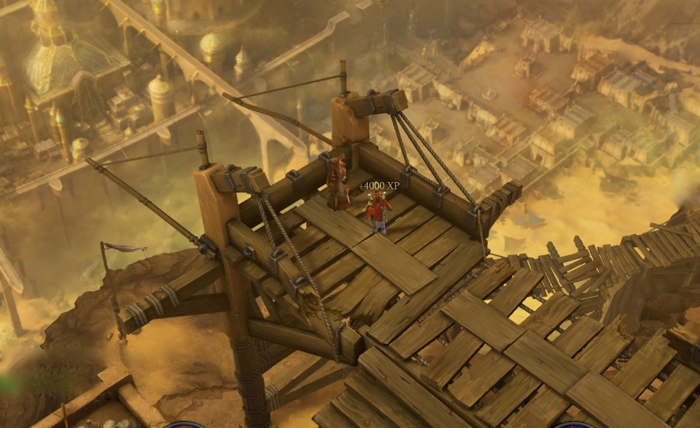 Kala has overcome her initial terror about being outside the palace and is ready to start a new life. Kala: I sold everything I own just to get by. I appreciate everything you’ve done for us, but I have to leave. Caldeum was never home to me. It was a beautiful prison. What does Kala mean by “us”? It is unclear. Maybe she made some friends in The Hidden Camp and noticed that the player character has been supplying the vendors with weapons and armor to sell to whatever new travelers pass through. There is another possibility. 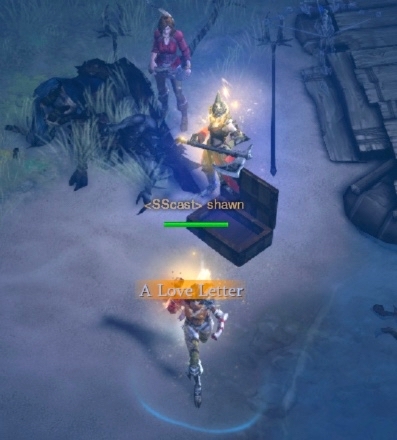 In Diablo III, the NPCs all seem to know about the quests that the player has completed. Kala might know that the player character is helping the people of Sanctuary by slaying demons and “big bads”. 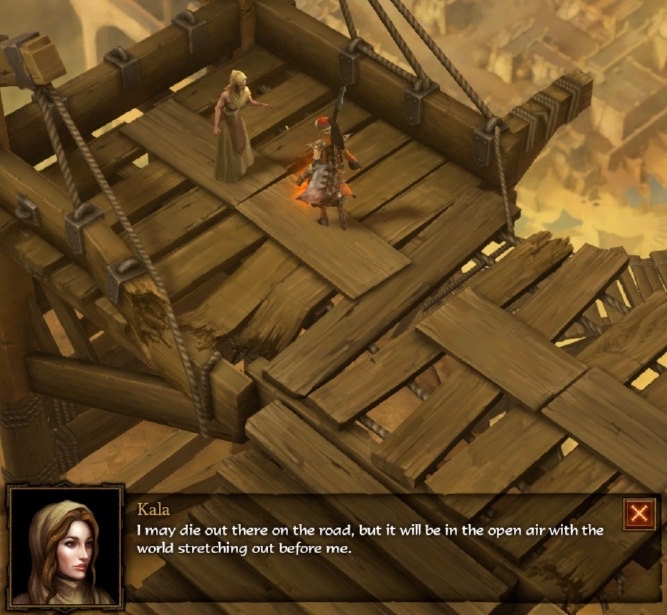 Kala: I may die out there on the road, but it will be in the open air with the world stretching out before me. 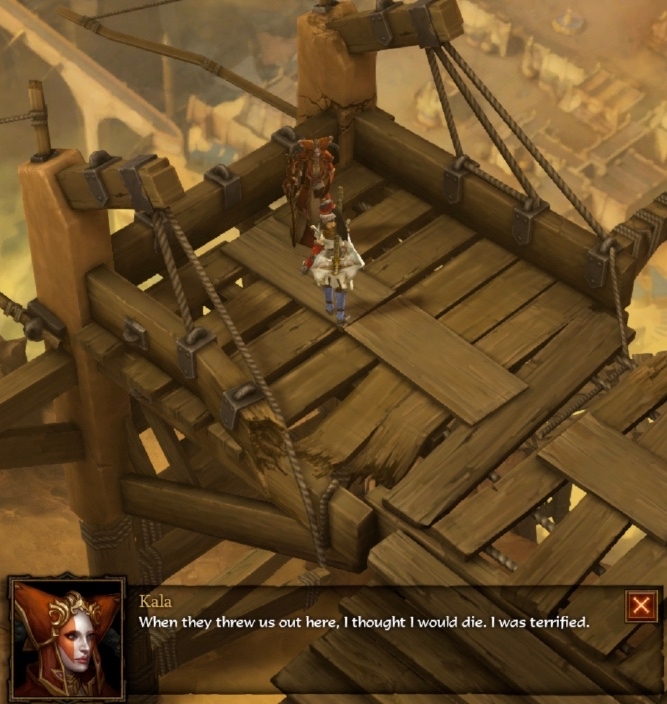 Kala the courtier has become Kala the poet-adventurer. She stared out terrified and experiencing culture shock, and has grown into a person who is confident enough to journey through Sanctuary all by herself. 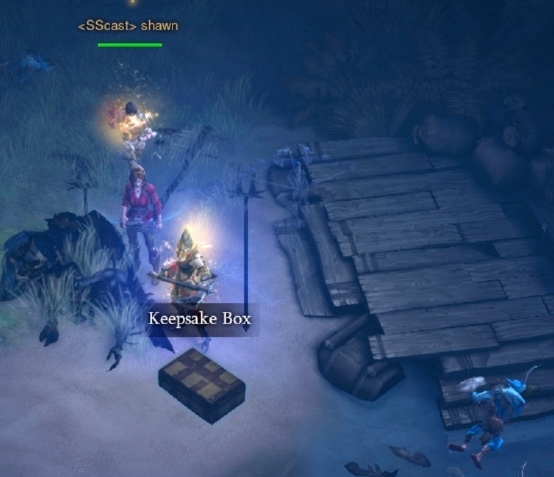 The Diablo III team created an NPC that shows character growth. It is small touches like this that make the storyline special. 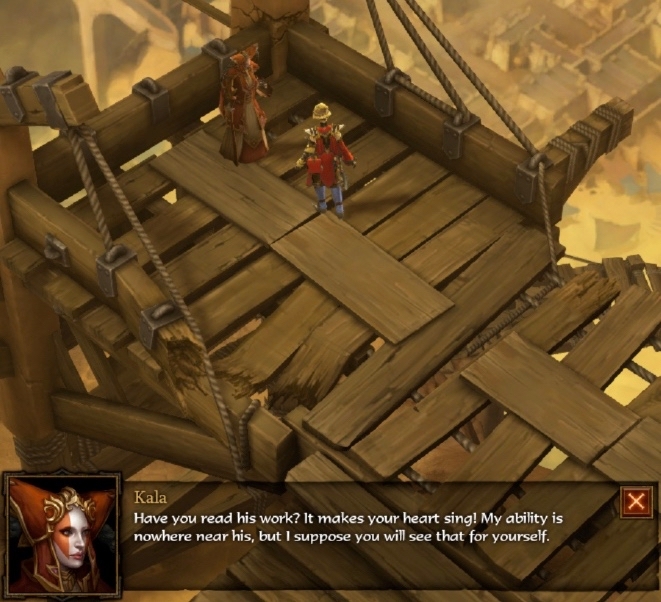 Later, the player can find a Keepsake Box while traveling with Leah through the Dahlgur Oasis. 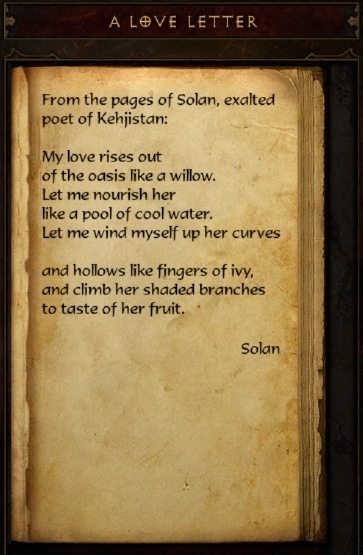 How did a poem by Solan end up in the Dahlgur Oasis? I would like to think that it was dropped by Kala as she traveled through this area. The writing of Solan was precious to her, and she would not have left it behind intentionally. I suspect Kala had to run away from some of the demons that infest the Dahlgur Oasis, and dropped the Keepsake Box as she fled. Somewhere in Sanctuary, there is a woman whose poems may become as famous as those of the poet who’s work she admired. 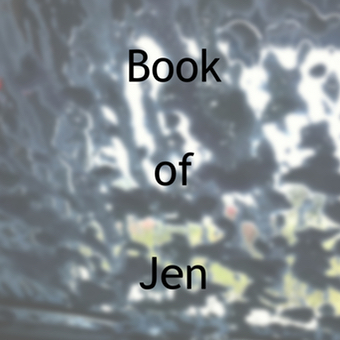 The Lore of Kala is a post written by Jen Thorpe on Book of Jen and is not allowed to be copied to other sites.